We recently moved a few states over due to military orders. I would love to say that things went perfectly and I have a whole list of tips and tricks to share, but the truth is there is a lot that I would do better or completely differently next time. Sometimes I felt like I was clutching my seat waiting until it was over. But our most important goal–making the move a positive experience for our daughters and not scarring them for life–was one that we actually got right. Well, I think so. I hope so. 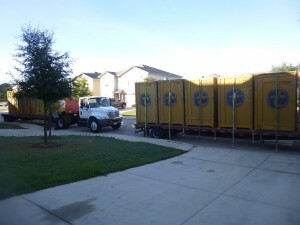 The trucks arriving with the crates filled with all of our belongings. When one of our girls ended up in the hospital during the move, we were able to see just how well we had prepared them to deal with this difficult time. For whatever it’s worth, here is what we tried to do and how it worked out. Stay positive and get excited. We also went online and looked at pictures and places around our new town to have something to look forward to. Warn them about what is coming. 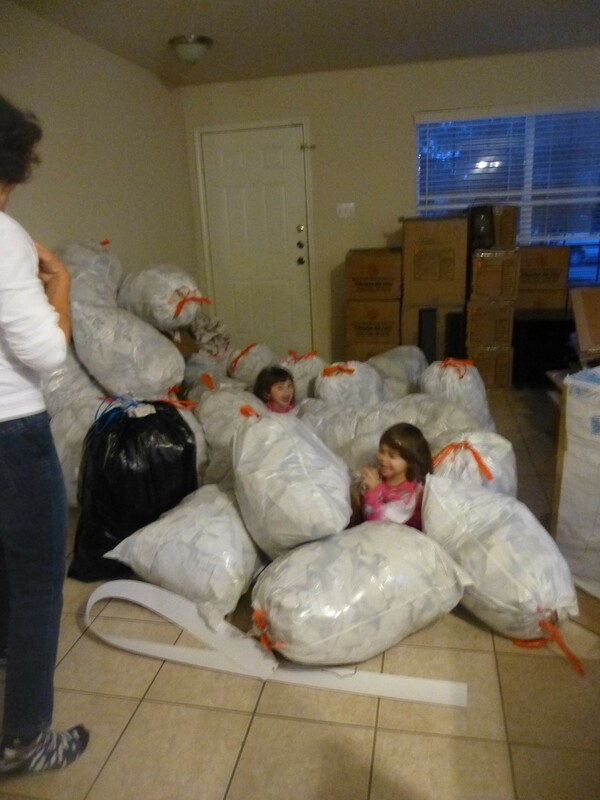 Surprising their Nanny by hiding in the packing materials. 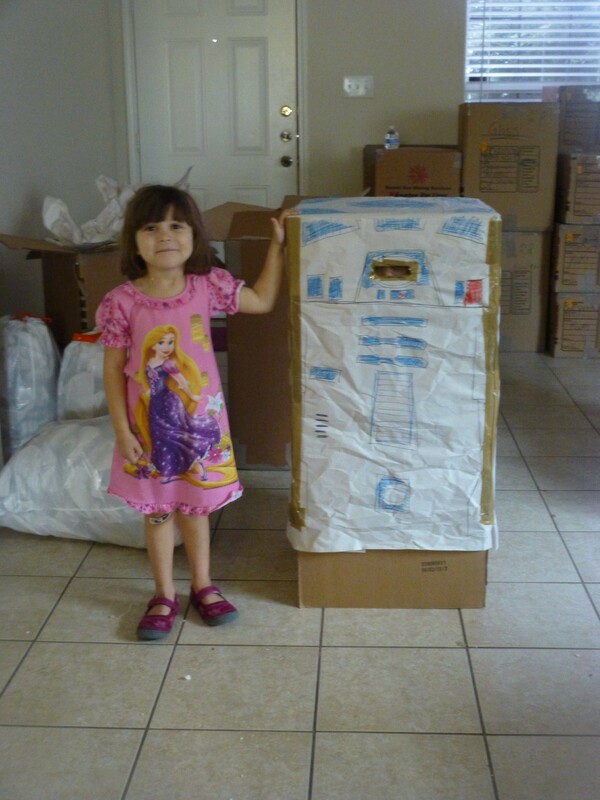 It’s easy to find jobs for even the littlest helper. They can pack or unpack their stuffed animals or toys. We had the girls go through their toys and choose items to donate ahead of time. We also had them set things on the counter while we unpacked and collect the packing paper after we were done. We tried very hard to make this a family adventure. This was an exciting time for the four of us to stick together. When things went awry, such as when we were forced to sleep in our car because bad weather had filled every single hotel in town, the girls just considered it one more adventure. And they learned that we stick together no matter what. 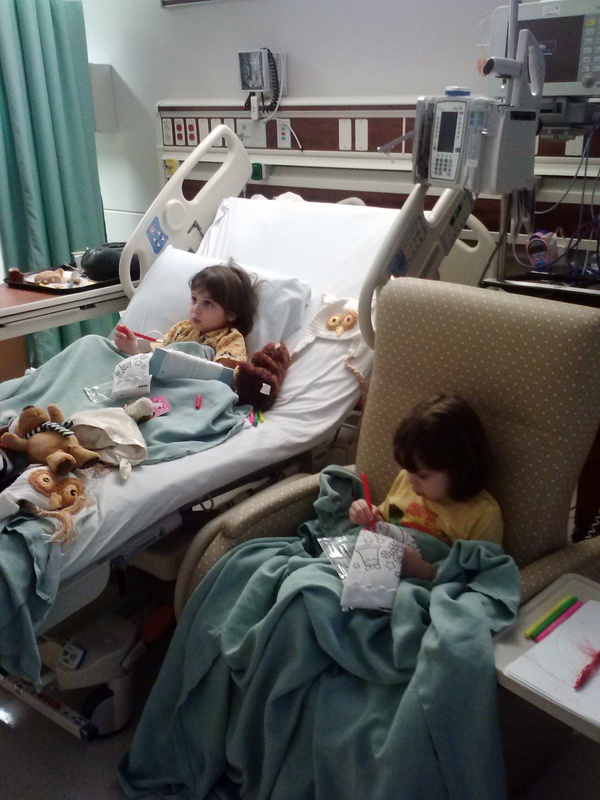 This lesson paid off big time when our daughter ended up in the hospital from a blood disorder. Riding in the ambulance was just another adventure in her mind (she asked if we could take a picture of her) and there was no question that all four of us would be staying at the hospital together. It was a Thanksgiving we will never forget! This is a stressful time for any family–well, it was for ours–but you can still have fun. It’s part of your family history so make some memories. 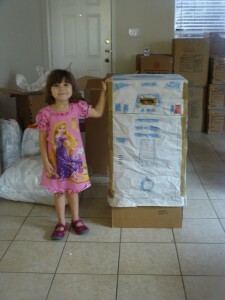 A proud Zoe poses next to the R2D2 they created while her sister is inside the robot.